A virtuoso performance from England's Laura Massaro in the finale of the 2016 China Squash Open saw her power to the title in straight games and gain revenge for defeat to opponent Nouran Gohar at last month's Hong Kong Open. Massaro fell to the 18-year-old Egyptian in a bruising quarter-final in Hong Kong but made amends on the edge of Shanghai's breathtaking Bund as she halted Gohar's 8-match winning streak, playing accurate and disciplined squash to take the honours and claim her first PSA World Tour title since winning the 2015/16 season-ending Dubai PSA World Series Finals in May. The World No.2 came through 11-9, 11-5, 11-3 in just 36 minutes to secure the silverware while Men's World No.1 Mohamed ElShorbagy bounced back from his shock second round exit in Hong Kong to defeat World No.2 Gregory Gaultier and claim the men's title - winning 3-0 in three minutes less than Massaro - and improve on his first round defeat here last year. ElShorbagy lost out to Australian Cameron Pilley in Hong Kong last month but looked back to the form that saw him claim six of seven PSA World Series titles last season as he overpowered Gaultier, the Frenchman who was hoping to defend the crown he won ahead of ElShorbagy's younger brother, Marwan, twelve months ago, to win 11-5, 11-3, 11-3. 18-year-old Egyptian Nouran Gohar kept up her recent winning streak on the PSA World Tour by defeating compatriot and 2015 champion Raneem El Welily to reach the final of the 2016 China Squash Open - where World No.2 Laura Massaro awaits. Gohar stormed to glory at last month's Hong Kong Open, defeating Massaro, Nicol David and Amanda Sobhy en route to the title, and has continued her impressive run - which now stands at 8 matches unbeaten - on Shanghai's Bund with a dominant performance against El Welily while Massaro came through a tough four-game encounter with New Zealand's Joelle King. The men's finale will see defending champion Gregory Gaultier, the World No.2, face off against World No.1 Mohamed ElShorbay after both came through their respective last four encounters with Karim Abdel Gawad and Borja Golan in straight games - with Gaultier's progress aided when Gawad retired with injury during the third game of their battle. Following an opening day of action that saw a host of title-contenders crash out of the 2016 China Squash Open it was a return to order during today's quarter-final action as all top seeds progressed in both the Men's and Women's draws, although Egyptian Karim Abdel Gawad was forced to call on all his sublime skills to avoid becoming the latest casualty on Shanghai's Bund. Gawad finished as runner up at last week's Hong Kong Open - his best ever result at a PSA World Series tournament - but was drawn into a ferocious battle with Indian Saurav Ghosal, conquerer of World No.8 Miguel Angel Rodriguez in round one, at the M100 event. The Egyptian, world ranked No.6, opened up an early 2-0 lead before Ghosal mounted a huge comeback to level the match and force a decider that was nip and tuck until the very end, with Gawad managing to sneak the vital points to win the fifth 11-9. "I'm very happy that I managed to win in five after I was 2-0 up and he managed to come back," said Gawad. "He played some unbelievable squash and is such a great player so all credit to him." He'll now face World No.2 and defending champion Gregory Gaultier in the semi-finals after the Frenchman got past Tarek Momen in straight-games while World No.1 Mohamed ElShorbagy continued his run with a straight-games victory over Mathieu Castagnet. ElShorbagy will take on Spaniard Borja Golan for a place in the finale after Golan ended Cameron Pilley's charge, following the Australian's impressive first round victory over World No.3 Omar Mosaad. In the women's draw top seeded Laura Massaro stormed into the last four courtesy of a straight games 3-0 win over India's Joshna Chinappa to set up a meeting with New Zealand's Joelle King while the second semi-final will see defending champion Raneem El Welily and Hong Kong Open winner and in-form star Nouran Gohar clash in what promises to be a breathtaking encounter. The opening day of action at the 2016 China Squash Open, PSA M100 & W70 tournaments saw Men’s Australian No.1 Cameron Pilley, Indian No.1 Saurav Ghosal and Women’s World No.35 Salma Hany Ibrahim all achieve wins over higher ranked opponents at The Peninsula Shanghai. Pilley, the World No.14, produced a strong performance to overcome World No.3 Omar Mosaad in straight games, with an 11-4, 11-5, 11-7 victory sending the 33-year-old through to the quarter-final where he will take on Borja Golan, who overcame Fares Dessouky 3-0. World No.21 Ghosal is also through to the last eight after coming out on top of a five-game thriller against ‘Colombian Cannonball’ Miguel Angel Rodriguez. Rodriguez had fallen to a shock opening round defeat to tournament wildcard Tsz Fung Yip during last week’s Cathay Pacific Sun Hung Kai Financial Hong Kong Open, but looked to have bounced back after taking a 2-1 lead against Ghosal. However, a shift in momentum saw Ghosal fight back and the Kolkata-born 30-year-old took the next two games without reply to consign Rodriguez to a second successive first round defeat and set up a quarter-final clash with Hong Kong Open runner-up Karim Abdel Gawad after the World No.6 defeated fellow Egyptian Mohamed Abouelghar. Elsewhere in the Men’s event, World No.1 Mohamed ElShorbagy and World Champion Gregory Gaultier got their tournaments off to winning starts with wins over wildcard Junjie Wang and Peruvian qualifier Diego Elias, respectively. Next up for ElShorbagy is a meeting with Frenchman Mathieu Castagnet, against whom the Egyptian has won the last four encounters. Gaultier, meanwhile, will go head-to-head with Tarek Momen for a place in the semi-final. The Women’s event saw 20-year-old Salma Hany Ibrahim come up with the day’s biggest upset, beating World No.13 Annie Au in straight games. Ibrahim’s reward is a quarter-final fixture with recent Hong Kong Open winner Nouran Gohar after the World Junior Champion dispatched Indian No.2 Dipika Pallikal Karthik in a comfortable three-game salvo. There were also wins for top seed Laura Massaro and World No.5 Raneem El Welily, with Massaro axing Joey Chan and El Welily overcoming wildcard Li Dongjin. Massaro will line up against fifth seed Joshna Chinappa in the last eight, while El Welily is set to face Alison Waters. New Zealand’s Joelle King and England’s Sarah-Jane Perry will contest the other last eight fixture after they rose to respective wins against Delia Arnold and Emily Whitlock. Egyptian World No.30 Zahed Mohamed put in a highly impressive final qualifying round performance to upset Hong Kong’s Max Lee and reach the main draw of the China Squash Open, PSA M100 tournament taking place at The Peninsula Shanghai. Lee, the World No.18, is fresh off the back of reaching a maiden World Series semi-final last week on home soil at the Cathay Pacific Sun Hung Kai Financial Hong Kong Open and looked to have maintained his fine form after taking a one-game lead on the tie-break. But a dogged Mohamed battled back and a virtuoso display from the 24-year-old saw him take the next three games without reply to record a superb 10-12, 11-6, 11-9, 11-7 triumph and set up a first round clash with World No.7 Mathieu Castagnet. Peruvian teenager Diego Elias was also in action in the final round of qualifying and the World No.34 dispatched Leo Au in straight games to ensure that he will take on World Champion Gregory Gaultier in what looks set to be a keenly-contested main draw fixture. There were also wins for Egypt’s Mohamed Abouelghar and Mexico’s Cesar Salazar, with the duo beating Paul Coll and Nafiizwan Adnan, respectively, both by a 3-2 margin. Abouelghar’s reward is a main draw matchup with Hong Kong Open runner-up Karim Abdel Gawad, while Salazar will go head-to-head with World No.10 Tarek Momen. The Women’s event saw top qualifying seed Dipika Pallikal Karthik overcome United States No.2 Olivia Blatchford in four games, while Hong Kong’s Joey Chan will join Pallikal Karthik in the main draw of the PSA W70 tournament after she defeated Malaysia’s Low Wee Wern. Hong Kong Open winner Nouran Gohar lies in wait for World No.19 Pallikal Karthik in the opening round of the main draw, with Chan set to face off against number one seed Laura Massaro. Egyptian pair Heba El Torky and Salma Hany Ibrahim were the other final qualifying round victors and have respective matches against Indian No.1 Joshna Chinappa and Hong Kong’s Annie Au in store. The 2016 Stars On The Bund China Open is set to be the biggest professional squash tournament ever to take place in China after it was today announced that prize money for this year's tournament will increase, with $100,000 on offer in the Men's tournament and $70,000 in the Women's tournament. A plethora of the world's top players, including the likes of Men's World No.1 Mohamed ElShorbagy, World Champion Gregory Gaultier, Women's World No.2 Laura Massaro and No.3 Raneem El Welily, will compete for the title in Shanghai – with the action set to get underway on September 1st. “We're delighted to see such a strong entry list,” said tournament director Franco Amadei. 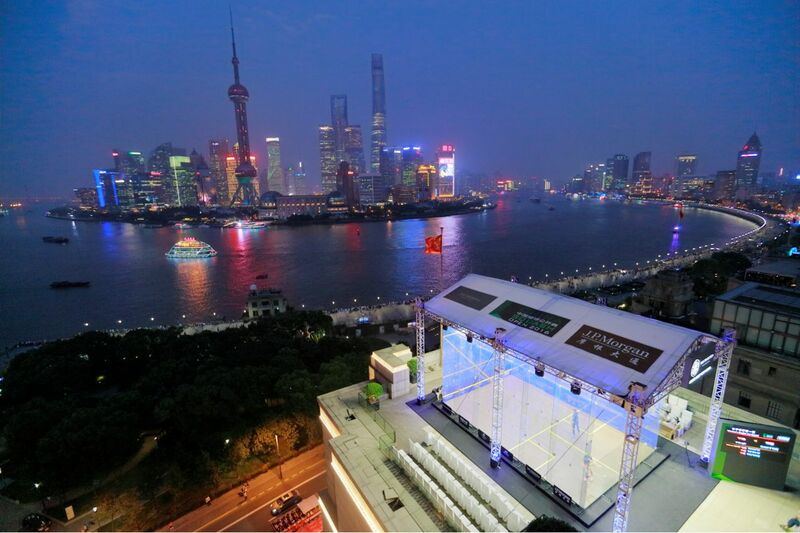 With an astonishing location for the glass court on the 11th floor terrace of The Peninsula Shanghai offering one of the most beautiful and iconic views of the city, the tournament continues to attract the world's best players and is increasing the popularity of squash in China.